With the Chicago Cultural Center’s programming in transition, artists and their audiences mourn some of the disappearing services as the city struggles to redefine its official stance on the visual arts in relation to tourism and commerce. Early on the city evicted a ground-floor gift shop from the Cultural Center, along with most of the respected visual arts staff. With the re-installment of longtime curator Lanny Silverman, the gift shop, too, has undergone some rehabbing into a mock souvenir shop. Named The People’s Palace’s Gift Shop, the life-size diorama created by Zachary Cahill playfully mixes cultural metaphors to draw uncomfortable parallels between capitalist and communist economies. “Yes, we’re open, come in,” announces a pink neon sign at the entrance, but the mock shop is otherwise confrontational and uninviting, having been besieged by economic catastrophe and slash-happy bears. The exhibition team boldly commissioned Cahill to layer confusion upon absurdity as a commentary on the Cultural Center’s mess of affairs, thereby holding up a mirror to its own painful transformation. Reigning supreme in the gift shop is the great bear, Cahill’s signature motif. The great bear evokes so many things all at once: He is a furry cheerleader for Chicago football and an adopted mascot of large, hairy gay men. The national mammal of mighty Russia, in the US the great bear is massacred in the wild and diving in the market. We stuff the great bear with our political fat, but he can carry the load; the great bear, despite his unhealthy diet, is always a symbol of power and pride. Sometimes the great bear gets paraded around in a new uniform—here, he has become Ghost Bear, the unquiet ancestor of the Cultural Center, whose logo is available on t-shirts and caps in Cahill’s retail shop. Bears are Cahill’s lab animals. They bring controlled associations to the table (footballers, gays, Russians), and also Cahill transplants new personas onto them. In the recent past, Cahill’s bear has been a sad clown and an orphanage administrator, among other unhinged characters. In the Cultural Center’s ruins, the bear has found its most fitting home. But if the pink pietà bear sculpture placed atop a cruciform of display shelving feels like a heavy-handed invocation of a master narrative, then it has successfully compounded the city’s shadowy authoritarianism with its anti-public services, sprinkled with false hope. 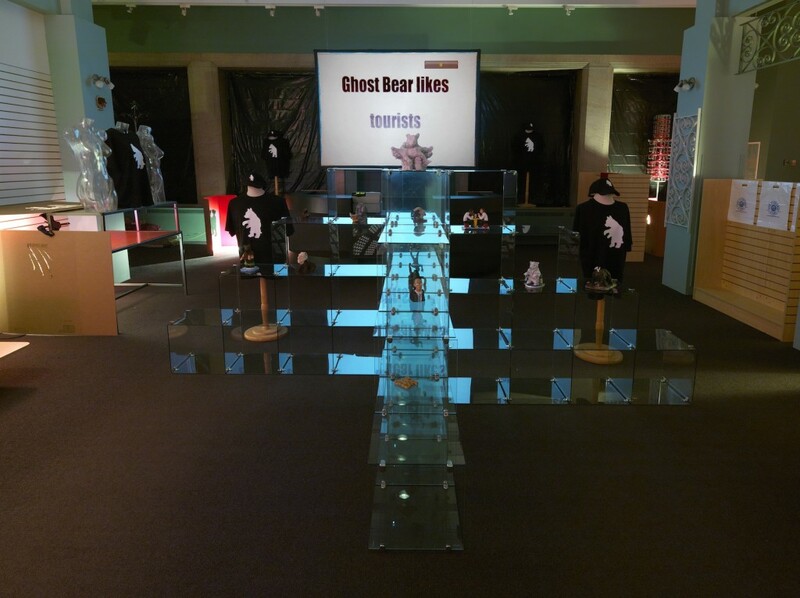 Like the Cultural Center itself, Ghost Bear is equal parts highbrow and populist, accessible and intellectual. It has something for everyone—to be afraid of. A chimera bear, with animal body and Werner Herzog’s head (in a twisted homage to the documentary “Grizzly Man”), is a one-of-a-kind tchotchke in the shop. Another trinket depicts Karl Marx’s ghost reading Obama’s book, “Dreams from My Father.” Lit from below with monster lighting and accompanied by an annoying soundtrack of electric guitar scratchings, the sparsely stocked People’s Palace’s Gift Shop, and its bizarro objects, may confuse tourists who seek cheery trinkets from their Chicago summer vacay. Yes, culture is for sale, even if the bear items are not actually priced. One must negotiate privately with the artist, off site, to make a purchase—an exchange that suggests shady back alley dealings. The People’s Palace’s Gift Shop asks, if culture is a civic good, available to all, then who pays for its maintenance? Who pays the price for its disrepair? Envisioning a possible dystopia, and watching the world self-destruct from our cozy premature coffins, is the new retro-futuristic sci-fi fantasy, but its message of hope is tinted with irony. Allora and Calzadilla’s 2007 battlefield in the Renaissance Society opened the floodgates, followed by Michael Ruglio-Misurell’s grim diorama of a ruined shopping mall at Gallery 400, in 2009. Cahill’s capitalism/communism bait-and-switch, which refigures failed capitalism as prosperous communism, is equally apparent in The Propeller Group’s cheerful 2011 “Television Commercial for Communism.” But for all of Cahill’s sentimental whimsy—“Ghost Bear forgot to pay his taxes” is one slogan—his gift shop is more crypt than heaven. The dark shop urgently, if speculatively, memorializes a cultural legacy that may or may not be too far gone. And always at culture’s exit is some sort of gift shop.